The Holy City on Gothic Records (G-49288) and released in November 2014 is a compendium of all the composer’s sacred choral music sung by Cathedra, a newly formed professional choir under the direction of Michael McCarthy and based at the Washington National Cathedral. It also includes a major work for organ serving as a closing voluntary and some short organ preludes and interludes. Extracts from many of the tracks can be heard under Choral Music and the Fantasia on a theme of Hindemith can be found under Music for Keyboard Instruments. The CD can be ordered directly from the composer at the cost of £11 within the UK, £13 within Europe and £15 in all other parts of the world. Includes p/p. Payment can be made through PayPal. Contact the composer by email to order a copy. This fascinating album, subtitled The Holy City, blesses the choral public with world premiere recordings of the complete sacred choral music by a highly versatile and affecting American-born composer who is new to me: James D’Angelo, a resident of England since 1984. Trained under distinguished mentors at leading New York institutions, he pursues a multifaceted career as a composer in many genres—performing pianist (both classical and jazz), organist, teacher, and advocate of music therapy. Cathedra, Michael McCarthy’s splendid Washington National Cathedral chamber choir, makes a very convincing case for his brand of sacred choral art. The album’s 17 tracks are divided between two works: an impressive and beautifully crafted Missa Brevis setting with an appended motet for Good Friday and a complete Evensong service that any Anglican church with a good choir would be pleased to present. These two works constitute D’Angelo’s entire sacred choral output. But here, both works are—in effect—presented as something of a single extended work, held together by mostly brief interludes and other pieces for organ that are thematically derived from both of its components: those organ pieces were written specifically for this recording. The entire a cappella Missa Brevis (no Credo) is a fascinating amalgam of triadic and impressionist harmonies that’s also remarkable for its exceptionally skillful interweaving of choral, sub-ensemble and solo elements. The short organ prelude gives way to a Kyrie movement of intermittently strident urgency, with arresting harmonic shifts. From the comparatively soft and reflective Gloria it’s not hard to imagine that the composer is a noted jazz performer. The Sanctus is positively frolicsome in places and downright jubilant in the final “hosanna” lines. The Agnus Dei is full of earnest abasement, supplication, and quiet misery. The final ‘Tenebrae Factae Sunt’ motet is highly effective: a wrenchingly dramatic account of Christ’s final utterances from the Cross. Upon hearing it, you’ll agree that this music is best left to choral professionals. The rather extended, organ-supported Evensong array is built around striking settings of the classic Magnificat and Nunc Dimittis canticles, with the obligatory Psalm (No. 31) crafted as a through-composed piece rather than in Anglican chant. But the opening and midpoint Anglican responses (with appropriate collects) range from straight-tone chant to call-and-response sequences; there’s also a lovely Lord’s Prayer setting. The service is fleshed out with the album’s title piece, a mystery-laced setting of the classic ‘Holy City’ text from the Book of Revelations; we also hear an achingly reverent Hymn of St. Patrick. While the various components of the service were composed (and revised) at different times and for varied initial purposes, they strike the listener here as an integrated work—largely thanks to the organ pieces that bind them together. Speaking of the organ, Scott Dettra plays it here with sensitivity and skill. He shines most brightly in the program’s only extended instrumental piece: the 11–minute Fantasia on a Theme of Hindemith that brings the album to its close. Director McCarthy—a veteran of several tip-top English choral ensembles (The Sixteen, The Gabrieli Consort, Monteverdi Choir, etc. )—is now music director at the National Cathedral; here he leads Cathedra, his most excellent 20-voice professional chamber choir, with stylish authority. This is the third release in Gothic’s very promising “New American Choral Music Series” from Washington’s National Cathedral. As usual, Gothic sees to excellent sound, with exceptional clarity (considering the large and airy venue) as well as particularly good balance between choir and organ. I haven’t heard the first two—but am now inspired to explore them, as this one’s well worth any sacred choral aficionado’s attention. Don’t miss it. American composer James D’Angelo has written many choral pieces in his appealing, multi-faceted style. His music is contemplative and atmospheric, as many new sacred choral works are today, but it’s so much more as well. D’Angelo’s rigorous technical demands make every moment of his pieces satisfying on many levels; his engaging rythmic surprises, his arresting melodic ideas and harmonies, and his powerful dynamic changes make for inspiring music to experience (and challenging music to perform). Your focus won’t wander in a D’Angelo piece. His music is a happy discovery for Choral Showcase, particularly from a new recording (on the Gothic label) by Cathedra, conducted by Michael McCarthy. David Ginder, Choral Showcase, radio station Classical WETA (Washington DC). As a music producer working in radio and television broadcast, as well as CD recording, one is exposed to a lot of music by living composers. Minimalism, collage and neo-romanticism of the (too) easy listening school still flourish, along with the ‘clone and insert’ composing technique of our time. James D’Angelo stands out as a unique voice conversant with the whole of the past century’s music, but one which at the same time commands a respect with its own honesty, individuality and authenticity. And the delight and vitality of D’Angelo’s music arises directly from its master craftsmanship, so rare a gift from a composer today. Malcolm Bruno, international independent music producer. In considering recording James D’Angelo’s sacred choral works with Cathedra, I was struck by how his writing shows the influence of so many elements. These elements are not just musical but of a much broader and deeper aesthetic. In approaching his sacred choral works, it is clear that James D’Angelo understands the ritual of prayer and this is not just the “how” but the “why”. His music is evocative yet authentic and original. It is a disc I have played often, not for vanity but because it continues to intrigue me. Michael McCarthy, Director of Music at The Washington National Cathedral (USA). James D’Angelo possesses an engaging compositional voice, writing music of deep character and sacred mystery, while remaining both elegant and stylish. I find his music to be compelling for both performer and listener. His Fantasia on a Theme of Hindemith is a work of great depth and color, using the organ in inventive and engaging ways. It is increasingly difficult to find composers who understand the organ and how to write well for it. James D’Angelo is in that rare category. Scott Dettra, renown American concert organist and Director of Music at The Church of the Incarnation, Dallas Texas. … James D’Angelo’s music is always beautifully crafted, sophisticated, yet eminently performable, with a subtle harmonic essence, derived at least partially from – it seems to me – Hindemith and Howells. His rhythmic resources are seemingly inexhaustible, and his scoring is varied and always appropriate. I have enjoyed James’s music in several genres: choral, brass and organ solo; his is an exciting 21st century voice, which deserves to become better known on both sides of the Atlantic. Adrian Partington, Director of Music, Gloucester Cathedral. There are many riches in this Washington National Cathedral CD. It is music that I will enjoy coming back to many times. I enjoy the composer’s rather unique harmonic vocabulary and yet with similarities to the music of Howells, Hindemith and Langlais. The performances are superb and Scott Dettra’s organ playing magnificent. David Briggs, internationally acclaimed concert organist and recording artist. James D’Angelo’s music has a striking and powerful language. He uses both the organ and chordal textures to create tension and a sense of peace in equal measure, conveying a deep sense of spirituality. The writing is demanding both for voices and the organ, but his work merits performance by the best, as the excellent recording by Michael McCarthy and Cathedra demonstrates. 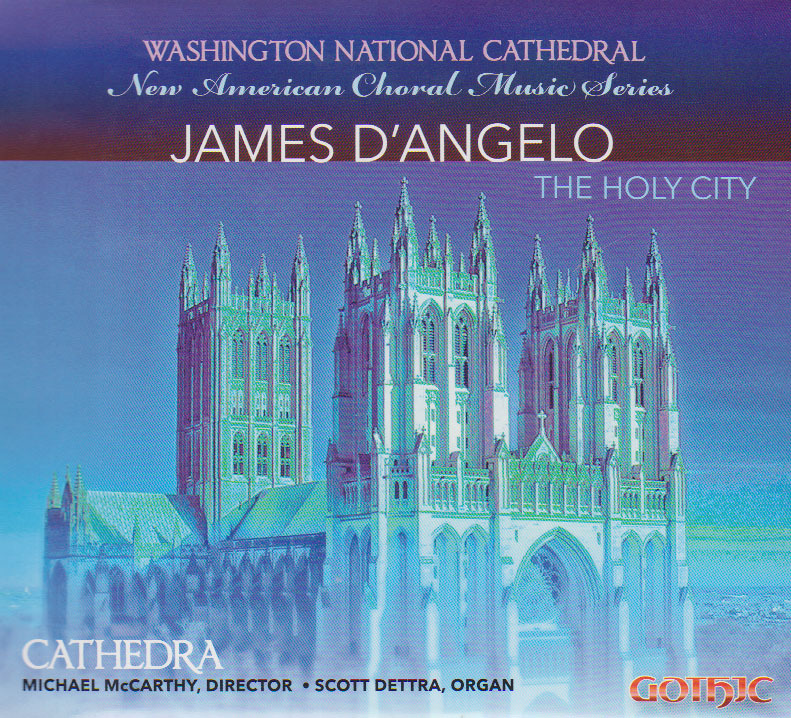 Recorded at Washington National Cathedral as part of the New American Choral Music Series, The Holy City comprises the entire catalogue of the sacred music of James D’Angelo. It is evident that he knows how to compose specifically for cathedral spaces. He allows for sustained voices to resonate and reverberate within the architecture of the cathedral as well as the cathedral of the listener’s body. While his music reflects influences of Tavener, Hindemith, Holst and the Renaissance composer Gesualdo, he maintains his own distinct voice. His musical palette consists of richly textured harmonies and word painting. He produces moods by layered chord structures, the fine use of dynamics and sensitive vocal colours. Moods move from pathos to surprise, joy and a deep soul stillness. His Tenebrae Factae Sunt is gentle and peaceful reflecting the gradual extinguishing of candles during the last three days of Holy Week before Easter. As the piece ends the organ chords hang in space like incense. The outstanding piece here is the title track The Holy City. Walk with him through the cloisters of the Holy City where pain is transfigured into light shining through stain glass windows. Delicious dissonance resolves in a way that we are reminded of our own spiritual quest. The work starts with a soprano voice supported by the choir underneath on wordless tones. With the phrase “Come in” the dynamics rise as the full choir sings with her. Listen how the harmony moves from dissonance to consonance, resolving on the word “God.” The repetition of the words “all things new” creates the image of an emerging spring. This world premiere recording is sung with passion by Cathedra directed by Michael McCarthy. Scott Dettra is the excellent organist. The Holy City is a work to listen to again and again. Whether you are a spiritual pilgrim, a musician or a music listener, each listening will bring new layers of meaning to these sacred works. Susan Elizabeth Hale is author of Sacred Space Sacred Sound: The Acoustic Mysteries of Holy Places (2007, Quest Books). She resides in Malvern, England. … the character of the sound impressed me enormously. I liked very much, how in the Kyrie of the Mass sequence, there is a feeling of approaching God with a reverence which I rarely sense in much of contemporary sacred composition. That approach of seeking out God, almost enquiring of Him creates a feeling of awe and mystery. It brings one into a contemplative sanctuary so that, by the time one is listening to the Evensong sequence, the sense of being absorbed, accepted and breathing with the heartbeat of the body of Christ felt quite natural and right within. I am reminded of the writing of Thomas Merton in which he brings your humanity into a new space before God which feels very cleansing and accepting at the same time. The Cathedra choir is outstanding. Their singing is very sensitive, beautifully balanced and shaped. They have a great feeling for and understanding of the composer’s musical intentions, especially in The Holy City and The Hymn of St. Patrick which are exceptionally beautiful pieces. Christopher Johnson, prominent contemporary British visual artist.